The youngest and most versatile of J.S. 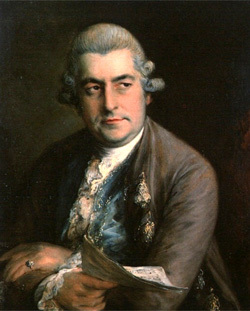 Bach’s sons, Johann Christian Bach (1735–1782) is well known among musicologists for the influence of his forward-looking works on the musical life of his adopted home, London, and on the young Mozart. Less known is his decisive influence on English copyright law. In 1773 Bach filed a lawsuit against the music publishers John Longman and Charles Lukey. At that time a copyright act from 1710 protected legal rights for “books and other writings” for up to 28 years, but music was often excluded from coverage. Common law allegedly protected publications beyond the 28 years, but there was a great deal of disagreement as to common law’s scope and validity. Royal privilege was also hotly debated, and provided little assurance to composers trying to protect their musical property. The suit involved a work that Bach identified as “a new Lesson for the Harpsichord or Piano Forte”. Longman and Lukey contested the case and repeatedly requested more time, delaying the settlement for three years. In 1777 the case was decided by the renowned William Murray, 1st Earl of Mansfield, Lord Chief Justice of the King’s Bench, who unequivocally placed music under the copyright act of 1710. Bach’s case served as a benchmark in English musical copyright law for the next 60 years. This according to “J.C. Bach goes to law” by John Small (The musical times CXXVI/1711 [September 1985] pp. 526–529). Many thanks to Joseph T. Orchard for his help with this post! Below, Emile Naoumoff performs J.C.Bach’s keyboard sonata in G Major, op. 17, in Paris in 2010.